And thanks to your support, the Single debuted at #3 in the Special Needs Memoirs and Special Needs Ebooks on Amazon. Going into this launch, I had zero expectations with regards to rankings. With every book I write, my hope is that the story speaks out to you. I hope that it makes you laugh and cry and have more brave days. And of course I want it to do well. Yet as launch day drew near, I did what most writers do: I simply prayed that it would not be a complete flop. And even if it was, I prayed to keep it in perspective, to remember that real success is in the effort, the attempt, the ‘showing up’. The ranking was just icing on the cake, though. The substance of ‘success’ was the sense of having dared to put this book out there. It was the beautiful comments from you. It was talking to my parents, and seeing how our family’s struggle was actually helping others. It was the feeling that this was exactly what I was meant to be doing. It was the same feeling I had as I walked up the stairs to a certain L’Arche home for the first time in 2007. It was the feeling of coming home. “Faith is taking the first step even when you can’t see the whole staircase.” – Dr. Martin Luther King, Jr.
*If you don’t have a Kindle, don’t worry! You can read Kindle books with Amazon’s (free) Kindle Cloud Reader. If you have Amazon Prime, you can also borrow the book through Amazon’s Lending Library. 2. Two new guest posts! My gratitude to Barrie and Tammy for allowing me to contribute to their lovely sites. And thank you to The Speech Ladies, Kristina and Cindy, who ran a special post to announce I Was A Stranger to Beauty. 3. 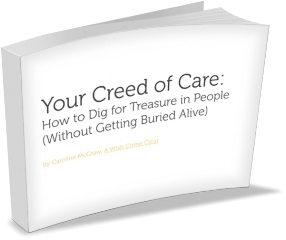 A revised version of Your Creed of Care: How to Dig for Treasure in People (Without Getting Buried Alive), thanks to my dear friend and designer Tamara Templeman. This book is my gift to you; feel free to share it with those you love. If you believe that it will serve someone else, pass it on! “Everybody can be great…because anybody can serve. You don’t have to have a college degree to serve. You don’t have to make your subject and verb agree to serve. You only need a heart full of grace. A soul generated by love.” – Dr. Martin Luther King, Jr.
4. A Wish Come Clear had its two-year anniversary last Wednesday; in the excitement of the launch, I nearly forgot. But two years, 126 posts, and an amazing community? That’s worth celebrating. and sharing stories is a way of bearing the light. How will you spend the MLK Holiday? Share your thoughts in the comments below! *L’Arche is a faith-based non-profit organization that creates homes where people with and without intellectual disabilities share life together. I spent 5 years serving the DC community in various caregiving roles.